Clean windows give customers a great first impression of your business and here at CCS we understand the importance of providing an efficient, cost effective, window cleaning solution for your company. Whatever the premises, we have the cleaning expertise to keep your windows clean and ensure your clients and visitors see your building at its best. 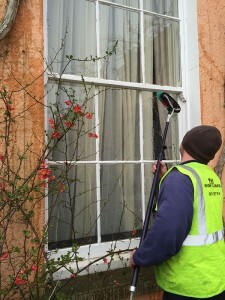 Our commercial window cleaning teams can work safely alongside your staff and visitors, or we can arrange to visit your premises outside of working hours if necessary. Either way we will always ensure minimum disruption to your business on a date to suit your schedule. Maximise the light your windows let into you home by booking a regular window clean with us. Our domestic window cleaning teams can clean both the insides and outsides of the windows, leaving you with a spotless view to enjoy. We bring all the equipment to site, including pure water, in our specially equipped vans. As well as residential windows, we also clean conservatories, conservatory roofs, VELUX windows and greenhouses. As standard all of our window cleaning prices include cleaning the window frames and sills at no extra cost. We’re always happy to offer advice on a window cleaning schedule to suit you and your diary or your business needs. The frequency of the clean may depend on personal preference or the area your windows are in. A shop window on a busy road may need daily or weekly cleaning, while offices and car showrooms may only need a monthly clean. Residential customers usually require a bi monthly or quarterly window clean. What’s most important is that our window cleaning service fits in with your budget, schedule and lifestyle. This means we offer daily, weekly, fortnightly, monthly, bimonthly or quarterly cleans as standard or we can tailor a specific cleaning plan to suit you. We’re trusted: Our loyal and dedicated staff are trusted by commercial and residential customers who allow us access into their homes and businesses every day. Got a question? Please check our window cleaning FAQs.